The English poet Robert Browning is best known for his dramatic monologues (dramatic readings done by only one character). By vividly portraying a central character against a social background, these poems explore complex human motives in a variety of historical periods. Robert Browning was born on May 7, 1812, in Camberwell, London, England. His father, a senior clerk with the Bank of England, provided a comfortable living for his family and passed on a love of art and literature to Robert. His mother, an excellent amateur pianist, gave him a love of music, while her strong and simple religious faith provided him with an lifelong belief in the existence of God. Robert was a bright child creating "masterpieces" of jam and pencil at the age of two and attending day school as "an infant." Browning went to primary school until he was fourteen, when his parents decided that he should be sent neither to a public nor a private school, but should instead be taught at home by a tutor. His training included riding, fencing, boxing, singing, and dancing along with the basics. The Brownings were a small, close-knit family, and Robert spent much time reading in his father's library of over seven thousand volumes. His father's love of the Greek tragedies prompted drawing room romps with the chairs as cities of Troy. Robert was very attached to all species of animals, hosting a wide variety of pets in his childhood. In 1828 Browning entered the University of London, but he dropped out after just half a year. Browning began to write verses at the age of six. His first published work was Pauline: A Fragment of a Confession, issued anonymously (without his name) in 1833. The hero of the poem is a young poet, obviously Browning himself, who bares his soul to a patient heroine. When a critic commented that the anonymous author seemed "possessed with a more intense and morbid [involving thoughts of death] self-consciousness than I ever knew in any sane human being," Browning promised himself to never again reveal his thoughts directly to his readers. Henceforth, he would "only make men and women speak." This major step in Browning's poetic development was evident in his next long poem, Paracelsus (1835), whose hero was a Renaissance (a revival in art and knowledge during the thirteenth to fifteenth centuries that started in Italy and moved to the rest of Europe) alchemist (early chemist). Though Browning later called the poem "a failure," it received favorable reviews and brought about important friendships with the authors William Wordsworth (1770–1850) and Thomas Carlyle (1795–1881) and with the actor William C. Macready (1793–1873). Encouraged by these friendships, Browning began to emerge in the London social scene. Encouraged by Macready, Browning turned to writing drama. But his first play, Strafford (1837), closed after only five performances. During the next ten years he wrote six other plays, none of which were successfully produced. All of Browning's plays are marred by abundant character analysis and meager dramatic action. In 1838 Browning traveled to northern Italy to acquire firsthand knowledge of its setting and atmosphere for his next long poem. But the publication of Sordello in 1840 was a disaster that dealt Browning's growing reputation a severe blow. Critics unanimously declared the poem totally unclear and unreadable, and modern readers still find it difficult. After the disappointing reception of both Strafford and Sordello, Browning turned to the dramatic monologue. He experimented with and perfected this form in the long poem Pippa Passes (1841) and two collections of shorter poems, Dramatic Lyrics (1842) and Dramatic Romances and Lyrics (1845). Usually written in blank verse (unrhymed verse), the dramatic monologue is the speech of a single character in a moment of some dramatic significance. In the course of his monologue, the speaker reveals what this situation is, as well as the setting of the situation and to whom he is speaking. Of greatest interest, however, is what he reveals about his own motives and personality. Often the speaker, while trying to justify himself to his listeners, actually reveals the faults of his character to the reader. Such works as "My Last Duchess," "Soliloquy of the Spanish Cloister," and "The Bishop Orders His Tomb" are poems in which the reader is given the pleasure of discovering more about the speaker than he understands about himself. After reading Elizabeth Barrett's flattering reference to him in her Poems, Browning wrote to her in January 1845. At that time, Barrett was an invalid confined to her room by a nervous disorder. The two became frequent correspondents nonetheless, and on May 20, 1845, Browning made his first personal visit. With his constant urging, she gained steadily in strength, hope, and will until she agreed to a secret marriage on September 12, 1846. Such secrecy was necessary because Barrett's father had forbidden all of his children to marry. Shortly after their marriage, the Brownings left London for Italy, and they made Casa Guidi in Florence their home from 1847 until 1861. It was there that their son, Robert Wiedeman Barrett Browning, was born on March 9, 1849. In 1855 Browning published Men and Women, a collection of fifty-one poems. Though the volume contained many of the dramatic monologues that are best known and loved by modern readers, it was not popular with Browning's peers. But it did receive several favorable critical reviews. After gradually declining in health for several years, Elizabeth Browning died on June 29, 1861. Browning found that he could no longer remain in Florence because of the memories it brought forth. He resolved to "go to England, and live and work and write." In 1864 he published Dramatis Personae. Though some of the dramatic monologues in the collection are complex and difficult or overlong, this was the first of Browning's works to become popular with the general reading public. His popularity increased with the publication of The Ring and the Book in 1868–69. This long poem is based on a murder and subsequent trial in Rome, Italy, in 1698. In a Florentine bookstall Browning had found an "old Yellow Book" that contained records of these events. The poem is composed of twelve dramatic monologues, in which the major characters give their interpretations of the crime. The accounts contradict each other, but eventually the truth emerges from behind the tangled web of lies and excuses. The Ring and the Book was enthusiastically received by the public, and Browning became an important figure in London society. He was a frequent guest at dinners, concerts, and receptions. In the next ten years Browning wrote with great energy, publishing a volume almost every year. But none of these works match the quality of Men and Women, and they are little read today. Though in the early stages of his career Browning's poetic reputation was far less than that of his wife, by 1870 he had achieved equal status with the famous poet Alfred, Lord Tennyson (1809–1892). The energy and roughness of Browning's poetry, however, contrasts sharply with the melancholy and polish of Tennyson's. Today, through his influence on Ezra Pound (1885–1972) and T. S. Eliot (1885–1965), Browning seems the most modern and enduring of all the mid-Victorian poets. 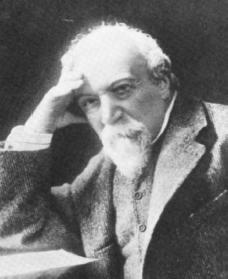 Browning died at his son's home in Venice, Italy, on December 12, 1889. In the "Epilogue" to his last collection of lyrics, Browning described himself as "One who never turned his back but marched breast forward,/ Never doubted clouds would break." He was buried in Westminster Abbey. Halliday, F. E. Robert Browning: His Life and Work. London: Jupiter, 1975. Markus, Julia. Dared and Done: The Marriage of Elizabeth Barrett and Robert Browning. New York: Knopf, 1995. Ryals, Clyde de L. The Life of Robert Browning: A Critical Biography. Cambridge, MA: Blackwell, 1993.